Fire Truck Park in Southside Place is another one of those parks that I’ve been meaning to go to for years, but somehow never made it. Well, we finally went and I’m sorry that I put it off for so long. There are two large play structures at this park. 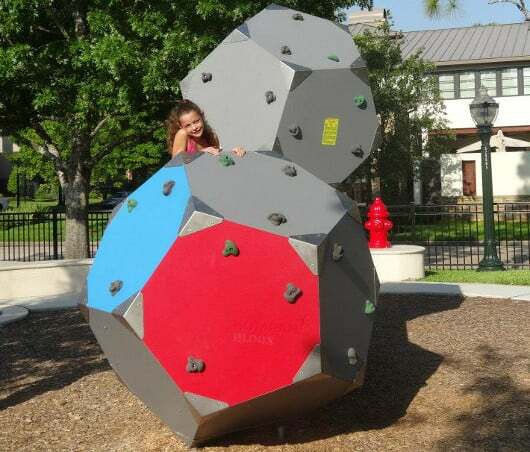 The one for older kids includes some of the fun features we’ve seen at other parks like the hanging pendulums and the climbing ropes. The one for littler kids is in the shape of a fire truck! It also includes fun activities, and the back of the truck is a gently sloped mini-rock wall that looks perfect for toddlers. Other equipment is scattered throughout the park. There is a large boulder-like rock wall for the bigger kids that definitely provided a challenge. A see-saw with a balancing “surfboard” platform in the middle was also a hit with the kids. Then there were the things we didn’t quite know what to do with. One looked like a mushroom with an upside down cap that spun around. 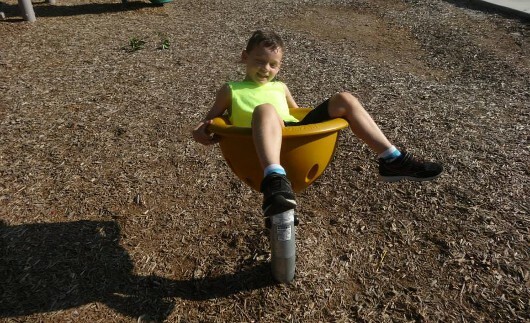 Lots of kids were just pushing it with their hands, but of course mine decided to sit in it so they could spin too! If your kids like getting dizzy as much as mine do, you should also have them try out the other two single-person spinning seats. We weren’t quite sure what to do with the large spinning ring either. After sitting and even lying down on it, they decided to copy some of the big kids that were there and tried to walk around it. 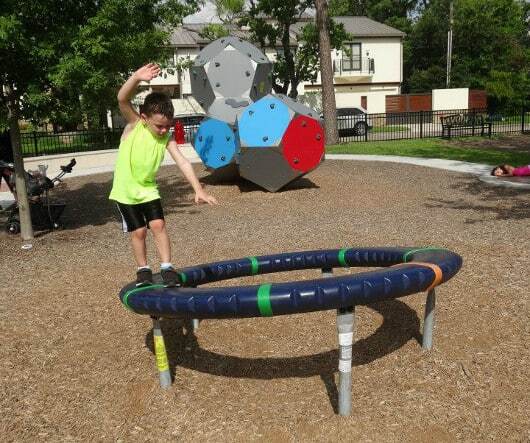 Because the ring is sloped and spins as they walk, this is more difficult than it sounds! After playing on all this exciting equipment the kids still made time to try out the swings and the tire swing. Oh, and if you’re wondering if you’ll need to be chasing your kids all over the park, don’t worry too much about it. The entire playground is fenced, and there is a pavilion with several picnic tables where you can sit and watch the kids, or have them grab a snack in the shade. 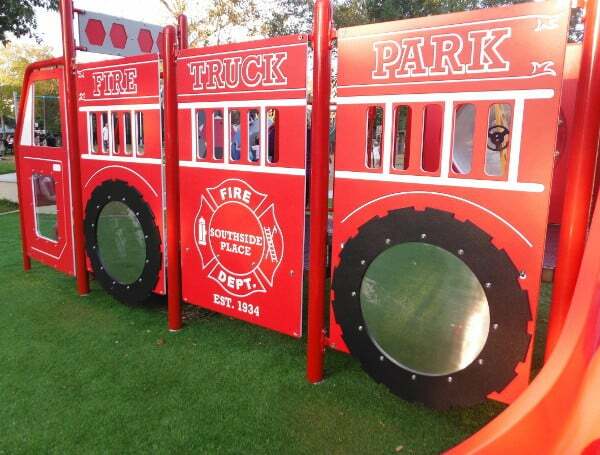 Check out another review of Fire Truck Park HERE.